What Would You Ask NASA Astronaut Chris Cassidy? 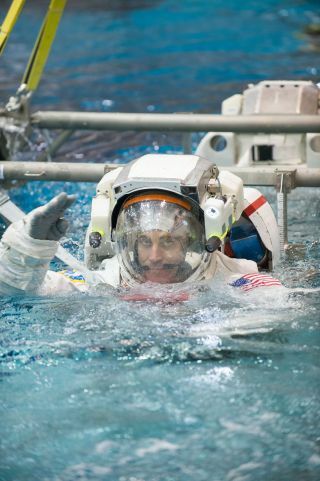 NASA astronaut Chris Cassidy, Expedition 35/36 flight engineer, attired in a training version of his Extravehicular Mobility Unit (EMU) spacesuit, is submerged in the waters of the Neutral Buoyancy Laboratory (NBL) near NASA's Johnson Space Center. NASA astronaut Chris Cassidy is counting the days before he launches to the International Space Station this month. But before he leaves Earth, Cassidy will touch base with SPACE.com and we want to know what you would ask the American spaceman if you could. SPACE.com's Clara Moskowitz will speak to Cassidy live on Friday (March 8) between 6 a.m. and 7 a.m. EST (1100 and 1200 GMT) in a NASA interview that will be broadcast live on NASA TV. And that is where you come in. What questions do you have for Cassidy, who is making his first long-duration spaceflight this month? You can watch the interview live SPACE.com here via NASA's webcast feed. Cassidy will launch to the space station aboard a Russian Soyuz spacecraft on March 28 at 4:43 p.m. EDT (2043 GMT), though it will be early March 29 at the launch site in Baikonur Cosmodrome in Kazakhstan. The NASA astronaut will launch alongside two Russian cosmonauts, veteran spaceflyer Pavel Vinogradov and first-time flyer Alexander Misurkin. It will be the first-ever same day flight to the space station by an astronaut crew. Chris Cassidy is a veteran NASA astronaut who first launched into space in 2009 during NASA's STS-127 mission on the space shuttle Endeavour, which visited the International Space Station. He performed three spacewalks to upgrade the space station with the addition of a porch-like experiment platform and an experiment module for Japan's Kibo laboratory module on the outpost. Cassidy, 43, hails from York, Maine, and has three children with his wife Julie. He is a commander in the U.S. Navy and served as a Navy SEAL for 10 years before joining NASA's astronaut corps in 2004. The three men will join three other members of their Expedition 35 crew (already aboard the station) when they arrive on March 28. Cassidy, Vinogradov and Misurkin will also form the core of Expedition 36, which will begin when the station's three outgoing crewmembers return to Earth later this month. Vinogradov will command the Expedition 36 portion of the mission. So, what questions do you have for Chris Cassidy? Let us know in the comments below! Email Tariq Malik at tmalik@space.com or follow him @tariqjmalik and Google+.Follow us @Spacedotcom, Facebook and Google+.